Samantha started her career in financial planning in 1992 after graduating from The University of Akron with a Bachelor of Science degree in Business Administration/Finance. She obtained her CERTIFIED FINANCIAL PLANNER™ certification in 1995 and joined Summit in 1996. She has extensive experience and expertise advising clients in the areas of wealth management, financial planning and investments. 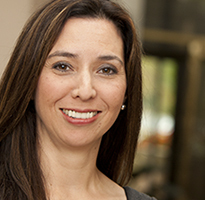 Samantha was named as the firm’s President and Chief Executive Officer effective January 2016. Samantha is an active member of the National Association of Personal Financial Advisors (NAPFA) and the Financial Planning Association (FPA). She has served on the NAPFA National Board of Directors as the Treasurer and Midwest Region Chair and the NAPFA Midwest Board of Directors as the President and Treasurer. Samantha has been quoted in numerous financial publications, appeared on CNBC, and is a frequent speaker on financial planning and practice management topics. In 2017 and 2018, she served as a member of the Advisory Board to Charles Schwab Advisor Services. Samantha spent her childhood in Oregon and has lived in Ohio since 1984. She resides in Blacklick, Ohio with her husband Robert and their sons, Alec and Aidan. She spends her time away from the office traveling, attending concerts, visiting Alec at University of Colorado Boulder, and watching Aidan play soccer and hockey.